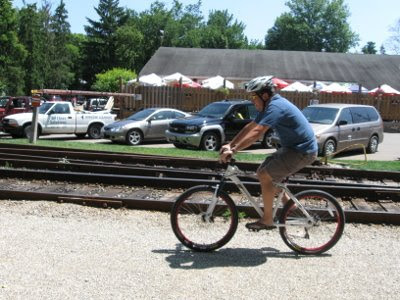 The 2010 model year bicycles are already starting to arrive. Yesterday, Sean, our Raleigh sales rep, stopped by to show us a sample of the new Raleigh Talus 5.0 mountain bike. The Talus series takes the place of the the mountain bikes known as Mojaves in previous years. 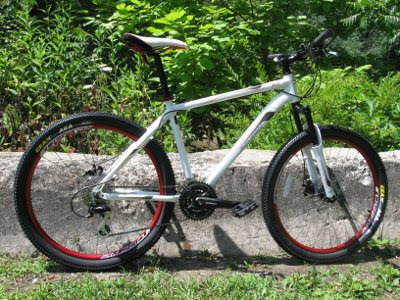 The Talus 5.0 falls in the middle of the sport hardtail mountain bike category, at $549.99. You can pay less for a mountain bike, but you wouldn't want to look at any less for a bike headed for real off-road mountain biking. The parts spec is solid entry-level, with a 24-speed Shimano Alivio drive train, Hayes mechanical disc brakes, and a Spinner front suspension fork with 100mm of travel. Where the Talus 5.0 really steps it up a notch is in the looks department. The custom-butted Atomic 13 aluminum frame is finished in a gleaming white, with red pinstripes and faux-carbon swooshes. 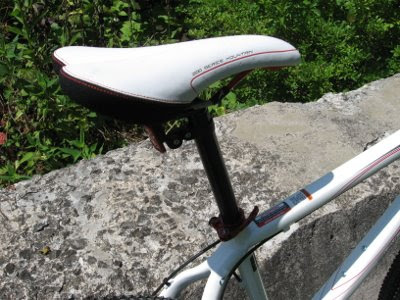 Add matching red rims, red quick-release seat post collar, and top it off with a matching white saddle, and you've got an eye-catcher with the looks of a bike twice the price. Sean models the Talus 5.0 with his official matching company-issue footwear. Hey man, the new 2010 Talus 5.0 looks sweet, I just got off the phone with my local dealer here in North Delaware, and I'm pretty stoked for the 2010 Talus 29. Maybe you could get a few pix and blog on the new 29? Century Cycles Night Rides in Bicycling Magazine! So Long and Good Luck, Ed! Ride Life. Ride Giant. Like Dhani Jones! The Night Ride is still on!